We made it back home in the wee hours of the morning, and it looks as though we missed A LOT of rain. Actually, these pictures kinda remind me of a safari for some reason, and they are very fitting for the state of my poor overgrown garden boxes. I have a lot of weeding to do this weekend! I don't mind, though-- I find weeding pretty theraputic. The girls get home in a half an hour and I CANNOT wait to see them! Time to get all their little souvenirs gathered and ready! It's the only thing I'm looking forward to right now. I missed them so dang much! What are you up to this weekend? Anything exciting? Happy Friday, friends!! I love those shoes! They look so great paired with that cute little backpack. My weekend is going to be spent studying for exams...so exciting! CUTE look! I need a pair of clogs! I've been searching! I find weeding therapeutic too! Unfortunately I have a crazy two year old that is causing me to fall behind on EVERYTHING! Lol that comment from Tech Lounge was from me. Didn't realize I was signed into my business email. Love your outfit! I'm so excited it's finally going to be 80 degrees two days in a row here :) Doesn't get much better than that! Glad you had a wonderful time and got back safe and sound! Also, I love weeding. Any chance that I get to spend outdoors for extended periods of time is a-okay by me! Aw fun! I love souvenirs! I bet the girls are just as excited as you. Glad you have the weekend ahead of you to unwind from vacation. Such a cute outfit! Have fun with your girls and giving them their souvenirs! that top is too cute! i loved following your vacation on instagram--looks like you had a blast! 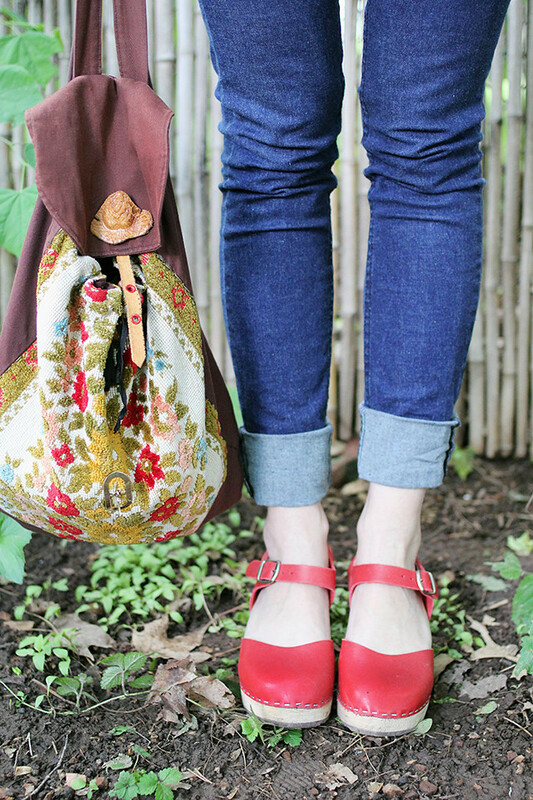 Best shoes and bag combo! super cute, i love the shoes! Katie cute look. Weeding is therapeutic, right? That and plucking my eyebrows can be better than a stress ball on any given day. I'm in LOVE with your bag; it's gorgeous! (and it goes so well with your top)!! So beautiful, Katie!! Inside and out.